I conducted an independent research project based on the following essential question: How might community-based organizations engage high-school-age youth in the process of designing curricula for paid summer learning programming? I conducted an independent research project to challenge assumptions about which stakeholders should, or could, participate in curricular design, what it takes to design “good” curricula for young people, and which skills young people should develop through paid summer learning programming. I was specifically interested in exploring how distinctions between access to and use of digital tools and experiences could be applicable to the design of learning experiences. ‍better understand the learning goals of both youth participants and adult facilitators in paid summer experiences. understand how youth and adult facilitators feel about the feasibility and value of involving young people in curricular design. identify potential barriers to and opportunities for the inclusion of young people in curricular design. Youth involvement in design is already happening. 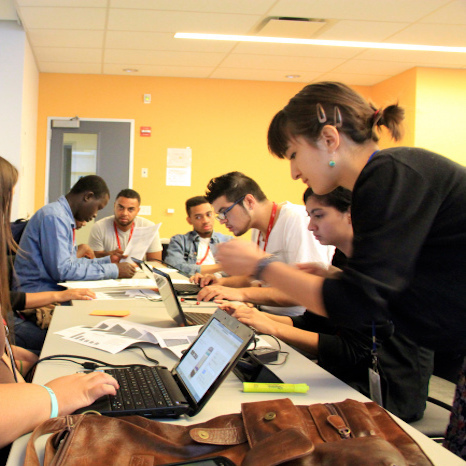 Youth and adult facilitators reported similar ideas of high quality summer programming. Curricular co-design raises complex questions without clear answers. There are multiple barriers to involving young people in curricular design. There are multiple opportunities for involving young people in curricular design. Both young people and adults want to engage in curricular co-design, but many youth-serving programs not yet mastered the adoption of co-design. While a number of barriers and challenges exist, the intentionality and prioritization of co-design, including bringing veteran youth into the design process, could promote co-design in immediate and tangible ways. Based on the identification of multiple opportunities for involving young people in curricular design, it seems promising that youth-serving organizations can better adopt youth-adult co-design in their programs. I am especially interested in further investigating the following question in future research: How might online tools promote and support collaboration among young people and adults in the process of designing meaningful learning experiences together? Young people, if given the right opportunities by adults in power, can be participants, co-owners, and designers of their learning experiences. However, this requires a deliberate and ongoing cultural shift towards undoing adult-centered and adultist practices, both at the individual facilitator level and at the organizational level. Without codified policies and practices to support youth-adult co-design, it may be difficult to ensure that young people are provided with meaningful opportunities to shape their learning opportunities. Yet, the potential benefits of co-design, both for youth skill development and for program quality, seem to far exceed any costs of adapting co-design practices.